Last week, I had the honor giving a keynote on Data-Driven Citymaking at Nordic Place Branding Conference in Stockholm, Sweden. I have to say, this was the first conference on place branding I have ever attended. And it got me thinking, what comes first, the place doing or the place telling? Normally, the answer to this would-be riddle would be a no-brainer. Well, there’s nothing to brand if there’s not a place first, right? But after listening to the stories of several places, which had previously not been on the map, successfully use place branding to create people-first places, I started to wonder…could you create a place, or at least put the forces in motion needed to do so, simply by telling its (authentic) story? 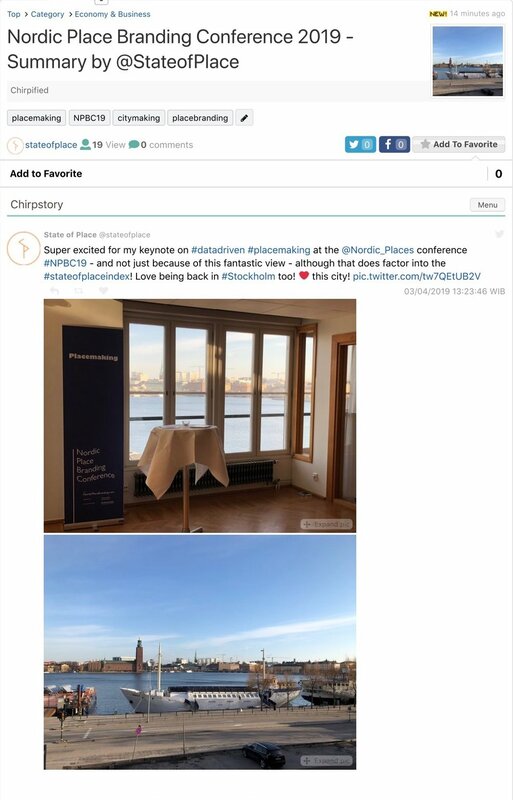 Check out our own “Twitter Story” summarizing the Nordic Place Branding Conference here! I also happened to love the story of Edmonton, Canada. While most decidedly on the “map,” they felt figuratively left out and forgotten. But rather than start simply by creating a place, they started by getting to know the people that made up their place - who they were, what they wanted, what their story was…so that their story would shape the place, rather than the other way around…because while they knew that the physical places in Edmonton needed some work, they knew that its people, its people’s values, its people’s stories were already incredibly valuable and unique and deserved to be lauded. So they started with some simple design-thinking strategies to discover the “why” behind the City of Edmonton and asked over 250 of its people, why Edmonton? From that, they distilled the “why” to four key themes - open, courageous, inventive, and cooperative. And they eventually translated that into physical placemaking strategies, from people-led, simple strategies, like painting the city’s new motto: “Take a risk, it’s the most Edmonton thing you can do” on the side of a building, to more awesomely elaborate city-led strategies, like building a ginormous LED-lit skating ramp meets track meets, I don’t know what to call it - I’m from Miami! I seriously loved how they started with crafting an authentic story first and then used that to organically create places that told that story. Finally, I was particularly impressed by the story of Mia Kemppaala, founder of Polar Bear Pitch. The City of Oulu had been home to Nokia, but after the company fell on hard times, the city was struggling. They needed a new identity - one built on hope, energy, and innovation, but also one that was uniquely Oulu! So turns out Oulu is like one of the most northern cities on the planet (no wonder this Miami-Cuban native had never heard of it). That remoteness had previously been perceived as a weakness. But they flipped that script and created a new story, promoting that as a unique strength. And man did they take a true leap of faith in that regard - quite literally a deep plunge! They turned the culture of no into a culture of yes by creating the first ever Polar Bear Pitch competition. Yup, you read that right. The City of Oulu now hosts an annual startup pitch competition - 2 minutes to pitch your concept while waist-deep in - I can’t even imagine what degree that is - below-freezing water! Once again, the spirit of the place, its story, its brand, helped create an authentic place, neither of which took themselves too seriously (those are my kind of people - and places! ).